Preachers using stale preacher jokes and cliches – When someone preaches a trite saying as if it had spiritual authority like scripture, it has NO spiritual power, and really just serves to weaken the message. While I agree, for instance, with the sentiment “God created Adam and Eve, not Adam and Steve,” that’s a trite observation that, in itself, has no spiritual power. It would be better to preach expositionally on the subject – THAT has power. Preachers using “Christianese” – I would *like* to bring my unsaved friends and neighbors to church, but not if they have to adjust to some ingrown clique with it’s own subculture and language. People who end every sentence with “Praise the Lord,” or who use bible words for perfectly normal words, esp. from the pulpit, are not relatable. Preachers using inaccurate statistics, quotes, or bad science – nothing says “idiot’ to my unsaved friends like some anti-intellectual garbage preached from the front. Check your facts. Though btw, I don’t consider Creation Science to be bad science, IF you approach the material logically v. relying merely on appeals to biblical authority. Preachers mis-applying scripture, using bad hermeneutics, and poor logic – as a budding preacher, I know how hard it is to stay faithful to the meaning of the text, rather than preach my own hobby-horse ideas, no matter how true they may be. But when a preacher tries to support his point (valid or not) by trying to apply scriptures to it that don’t mean what he is trying to imply, I get pissed. Even worse is when they misinterpret passages due simply to bad hermeneutics, i.e. they ignore standard rules of interpretation. Humanistic nicey-nicey preaching – nothing says to me “unredeemed sinner trying to earn salvation by being good” like preachers who preach a positive Christian ethic of ‘love thy neighbor’ without preaching the other side of the coin, which is ‘repent and be born again.’ Preachers that *might* fall into this category are Robert Schueller or Joel Osteen (though I don’t condemn either of them – I kind of enjoy Osteen). But I can tell when the preacher has no anointing, and no idea about what the gospel of regneration really is – the spiritual deadness and humanistic syrup is palpable. Self-righteous, finger-pointing, hellfire and brimstone preaching – hey, don’t get me wrong, I like strong, convicting teaching. But there is a difference between one-sided, hell-threatening, fear-mongering, guilt-manipulating conversion and the type of truth telling which leads to honest admission of guilt. Brow-beaters who seem to except themselves from the category of ‘sinner saved by grace’ (regardless if they say it, what they think is obvious in their demeanor), and fail to have any understanding of what it means to be on the other side of grace are off-putting. Hype and emotionalism – even though I don’t care for dull, tepid worship and passionless preaching, I hate the other extreme as much – churches where they think yelling, stirring oneself into a tizzy and fainting, or other manifestations mean that God is there. I’m all for expression and emoting in church, and I understand that some church subcultures have a tradition of more boisterous worship. But even among them, I know they know the difference between freedom to shout and meaningless hype without real scripture teaching.It reminds me of an old joke about a preacher who went to visit a church with charismania going on. A church member stands up in a burst of emotion and says “thus sayeth the Lord, I am here!” The preacher, irritated with the hype, stands up and says “thus sayeth the Lord, NO I am NOT!” LOL. Passing the plate – I just hate ruining the great spirit of conviction or worship with this purely administrative action – it’s such a downer, esp. when people are very sensitive to guilt manipulation when it comes to their wallets. 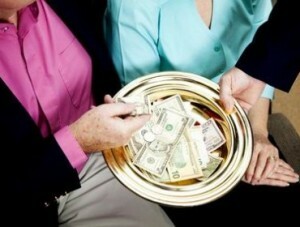 I much prefer churches that simply remind you that there is a box or bucket in the back for their tithes and offerings. And soon, I hope to finish my church’s web site and get a paypal link going. Unbiblical prayer – Man, does this bug me. When people pray things like “God, be with us” or “God, bless this [fatty] food to our bodies,” I want to scream! Don’t you know God won’t answer stupid prayers? God has already promised to be with us. He also can’t change fat into fiber just because you don’t want to exercise self-control. The entire reason that Jesus, Paul, and James gave instruction in prayer is to explain to us how to pray *better*, and explain why certain prayers do NOT get answered. Wise up, and pray biblically. Therefore, if you died with Christ from the basic principles of the world, why, as though living in the world, do you subject yourselves to regulations – ‘Do not touch, do not taste, do not handle,’ which all concern things which perish with the using – according to the commandments and doctrines of men? These things indeed have an appearance of wisdom in self-imposed religion, false humility, and neglect of the body, but are of no value against the indulgence of the flesh. A: Because someone might see them and think they are dancing. Q: Why should you always invite two Baptists on a fishing trip? A: Because if you invite only one, he’ll drink all your beer, but if you invite two, neither will drink. Cliques – nothing says ‘ingrown’ like religious cliques that you can’t feel welcome in. It’s great to have a close circle of friends, but make an effort to include new people – they have a lot to give. Poorly kept grounds or buildings – sad-looking grounds and buildings speak volumes to me – it says that there is no excellence there, or poor leadership, or some other spiritual illness. I’m not looking for perfection, just some care for what you are and what you own. It’s called Stewardship. Female pastors – I have been studying what the bible says on women in church leadership, and am currently of the mind that, while the scriptures allow women in all kinds of ministry positions, and even in five-fold ministry positions (Ephesians 4:11), the one place that I think scripture clearly forbids women is as Elder-Pastors who teach and lead the flock. Have a female pastor at the helm? You are, in my mind, already leaving God. Now, I have no problem with women missionaries, deaconesses, evangelists, or even those with teaching ministries like Kay Arthur (awesome), Marilyn Hickey, or Joyce Meyer. But the place of authority and spiritual direction over a local church belongs to a male pastor. I’m sure we’ll need more discussion on that.Of course, it goes without saying that if a church has a gay person in leadership, they are not even a church of Christ’s at all, but an apostate church. Such a place has long ago left the knowledge of God, though I’m sure many are ‘very nice people.’ But God has called us to be good, not just nice, and goodness includes holiness. 1800’s church culture – look, if your church is still singing hymns from the 1800’s, speaking King James English, and using KJV pew bibles, your church has a problem. You see, we are no longer living in the 1800’s, and God has been moving in the world since then, though probably not much in your church if He’s inspired no new music. Don’t get me wrong, I love to sing hymns in church, mixed in with our contemporary music, and I think we need to enjoy the riches of our historical heritage. But I also know that, if our internal church culture remains stuck in the past, we are not relevant or spiritual alive. I’m not saying we need to adopt modern culture’s worldly values, nor am I saying we need rap music on Sundays, but I am saying that God is not trapped in the culture and language of the past, only you might be. And your friends and neighbors only want to go there during Christain History month, not every week. Why are churches not like the Church? i loved the baptist jokes. haha… i grew up going to a baptist church and just find so much humour in the dancing joke. anyways, sweet list. i like how you just take a stand on things even if they could be taken controversially. people with passion and confidence in their beliefs make me smile. Godbless ya! Humble is not one thing people call me very often (unfortunately), but thanks! But the place of authority and spiritual direction over a local church belongs to a male pastor. Louis, just because YOU seem to have no taste for identifying the differences between male and female, does not mean that those who do are evil. I mean, if I said 'women must be the ones to get pregnant' or 'women should not be in the infantry,' you would probably make a similar argument that this was sexist. Of course, in the case of pregnancy, you would not, but I would argue that the same 'argument from nature' you make for women can be made based on the physical and emotional makeup of men and women in general. And I think that one of the MOST understood attributes of God is the biblical (and correct) view of authority. The fact that women should not be pastors is controversial, even among xians, but I dare say that they are being unbiblical, and resisting even what nature teaches. But again, I do not expect someone at odds with his own nature to understand the limits and principles of seeing God in nature. There you go again. This argument from "nature" or "natural law" or whatever you want to call it is getting tiresome, especially since you refuse (or cannot) provide any evidence whatsoever that such a thing exists. Since you cannot, I will just disregard any argument based on this ghost and (justly) label it as bullsh*t until (if) you do so. In other words, it's just your prejudice and delusion drooling here.
. Since you cannot, I will just disregard any argument based on this ghost and (justly) label it as bullsh*t until (if) you do so. I am doing my homework to help explain what this argument is, and why the greatest thinkers of all time used a version of it, including Aristotle, Locke, and others. You may think it is bull, but you are on the short end of the intellectual stick if you think so, historically speaking.